Former officials begin trial on charges of deceiving residents to loot public funds. 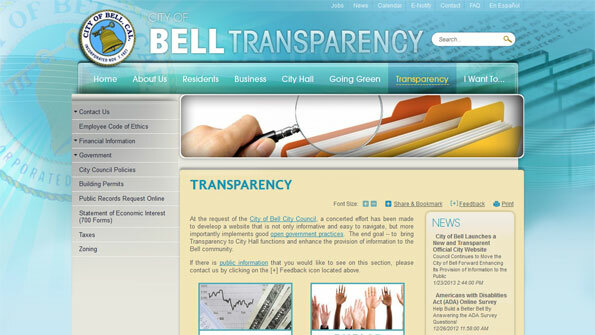 As six former city officials accused of corruption begin trial, Bell, Calif., launched a new website which current officials say signals a new commitment to transparency and redress of the past. The six former city council members began trial Jan. 24 on allegations they looted public funds from the Los Angeles suburb, in part by hiding huge salaries from the public. Current Bell officials say the new website reflects their efforts to repair the city’s reputation and restore faith in local government. The website makes city legislative activity and financial data easy to find and accessible to all citizens. The website includes a Transparency tab on the main navigation bar. Residents can click on the tab to get information about finances and taxes, zoning, city council policies and an employee code of ethics. The website’s design was facilitated by Vision Internet and guided by a 10-point Transparency Checklist. The checklist was created by the Sunshine Review, a non-profit organization dedicated to educating the public about proactive disclosure; Institute For Local Government guidelines; and California state transparency laws. Items on the checklist include budgets, open meeting laws, audits and lobbying. Anderson, S.C., has a website that also incorporates the Transparency Checklist, according to officials at Sunshine Review. The six former council members are accused of misappropriating about $1.2 million in public funds by getting paid almost $8,000 a month for attending “phantom” board meetings that never took place or lasted only a few minutes. Residents of the city of 38,000 were shocked to learn of huge salaries for city officials, including an $800,000 annual salary for former city manager Robert Rizzo, who is scheduled to be tried in a separate case.